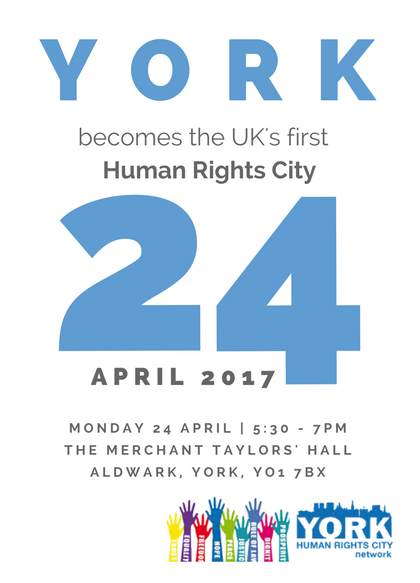 On 24 April 2017, the Right Honourable, the Lord Mayor of York, Councillor Dave Taylor, will declare York to be the UK’s first Human Rights City. As the UK’s first Human Rights City, York has the ambition to use human rights in decision making, promote awareness and debate about human rights and ensure all residents’ rights are respected. The Hall is wheelchair accessible. Please get in touch to confirm any other accessibility requirements. Parking is available for disabled guests but needs to be reserved in advance. Please contact info@yorkhumanrights.org. Pledge your support for York to become the UK’s first Human Rights City here. Human rights are the fundamental rights and freedoms we have because we’re human. They’re ours and can’t be taken away. Sometimes we think human rights are important for people in far-flung countries but not here. But wouldn’t you say that all children should have an education, elections should be free and fair and that we should have the right to be involved about important decisions that affect our lives? Human rights have been used in big cases like the Hillsborough disaster – they helped uncover the truth and get justice for survivors and families. But they also make a difference in our daily lives. For example, we all have the human right to the highest attainable standard of physical and mental health. What's a Human Rights City? No matter where you live, councils and other authorities make plans and policies all the time. Throughout the world, cities have declared themselves Human Rights Cities. In other words, they’ve committed to putting these fundamental freedoms at the heart of everything they do. We would be the first in the UK – isn’t that worth celebrating? What does the declaration mean? Declaring that York is a Human Rights City definitely doesn’t mean we’ve got it all sorted. The declaration marks an ambition. It represents a significant point in our journey, but not a destination. It means that enough people in York want to see our community become the UK’s first Human Rights City, putting these fundamental rights at the heart of our policies, hopes and dreams for the future. We know we’ve got a long way to go. But with your help, we can get people talking about human rights, use human rights in decision-making and work towards making sure all York residents’ rights are respected. There is no public parking available at the event. The closest public car parks are: Monk Bar car park or Foss Bank car park, which closes at 8pm. The Merchant Taylors’ Hall is a 5 minute walk from Stonebow public bus interchange and St Saviourgate taxi rank.